RAE Systems MultiRAE Multi Gas Meter Rental | Enviro-Equipment, Inc. The MultiRAE is the most advanced wireless portable chemical detector on the market with a 0.1 to 5,000 ppm PID sensor range, the broadest in its class. The rental meter comes standard with a PID, carbon monoxide sensor, oxygen sensor, hydrogen sulfide sensor, and lower explosive limit (LEL) sensor. 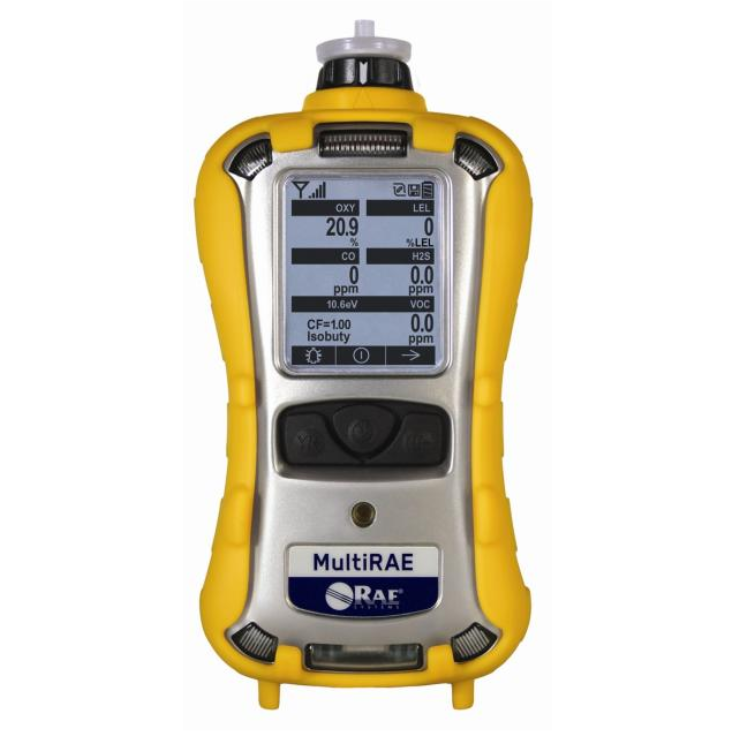 The MultiRAE can be used for a variety of applications, including industrial hygiene, personal protection, multi-gas leak detection, and HazMat response. The instrument boasts the largest display and longest battery runtime in its class (with an optional extended battery), as well as an ergonomically contoured case that is rugged, dust-tight and waterproof (IP-65 rating). Real-time reading of gas concentrations; PID measurement gas and correction factor; battery status; datalogging on/off; wireless on/off and reception quality. No effect when exposed to 0.43mW/cm2 RF interference from a 5-watt transmitter at 12"
1 Contact RAE Systems for availability. 2 RAE Systems recommends calibrating sensors on installation. 3 Additional equipment and/or software licenses may be required to enable remote wireless monitoring and alarm transmission. 4 The CO + H2S combo sensor is required for a 6-gas configuration. 5 Specifications are subject to change.